Do you love language, travel and meeting people from other cultures? PhraseMates contains millions of phrases in English, Chinese, Japanese, Spanish, French, German, Italian, Portuguese, Farsi & Khuzdul. It’s like a giant phrasebook with a twist. You can add phrases and share them with other users or “mates”. If you are a beginner, no worries, you can ask other mates to translate something for you. Translate for others and score karma points to help you appear higher in the Mates list and meet people. When you start PhraseMates for the first time you will be asked what language you want to learn and your native language. PhraseMates uses these choices to determine what phrases to show you on the Phrases screen. You will then be asked to login with Facebook. Because PhraseMates includes user generated content, it's important to limit spam and other non-desireable content that comes with anonymous logins. We will never collect personal information or post to Facebook without asking. If you don't have a Facebook login, you can still search for phrases and access many of the other features. The phrases screen displays phrases ordered by their popularity to the community. To search phrases, enter a keyword in the search bar and tap Search on the keyboard. The flags in the search bar determine the search direction. Enter a keyword in the language of the flag to the left of the keyboard or tap on either flag to change your choice. Each phrase pair has thee icons below it. Tap the heart icon to save a phrase to Favorites. Tap the flag icon to signal that a phrase is incorrect or spam. Tap the share icon to send a phrase to a friend via text or email. Tap the plus icon top right of the screen to add a phrase. PhraseMates is all about contributing to the community so you score karma point for doing this. Make sure to use complete sentences, capitalizaton and punctuation so the quality of our database is maintained. 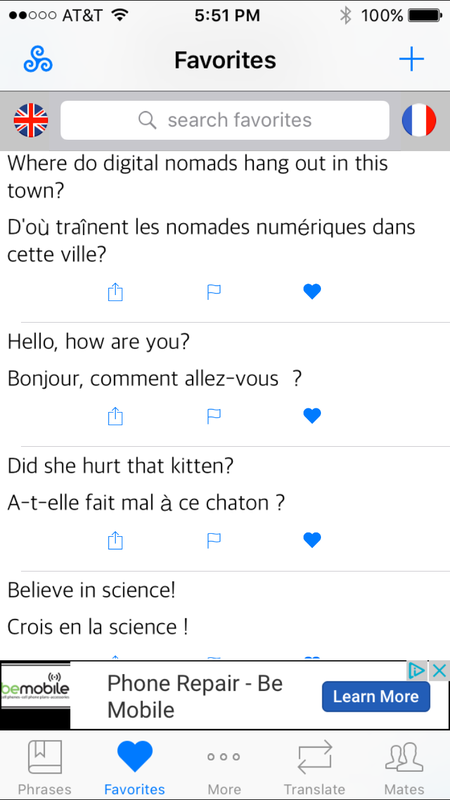 When you tap on the hearts icons in the Phrases screen you add them to your personal phrasebook. This can be useful to keep a list of phrases to study or for quick reference. You can search Favorites for keywords and use the search bar flags to change languages. 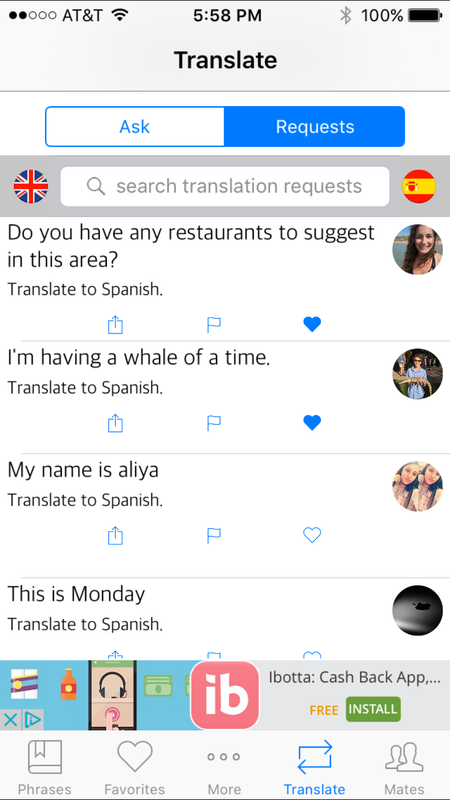 Tap on Translate to Ask for translations or answer other users Requests for translations. Start by verifying that the langauges are set correctly or tap on the flags to switch langauges. Enter your phrase in the top field and tap on Done in the top right to save your request. You will be directed to the Requests tab so you can see your translation. If you don't see your translation, swipe down and verify that you language selectors are set correctly and scroll down the list. If users favorited any of the Requests they may appear higher than your request. 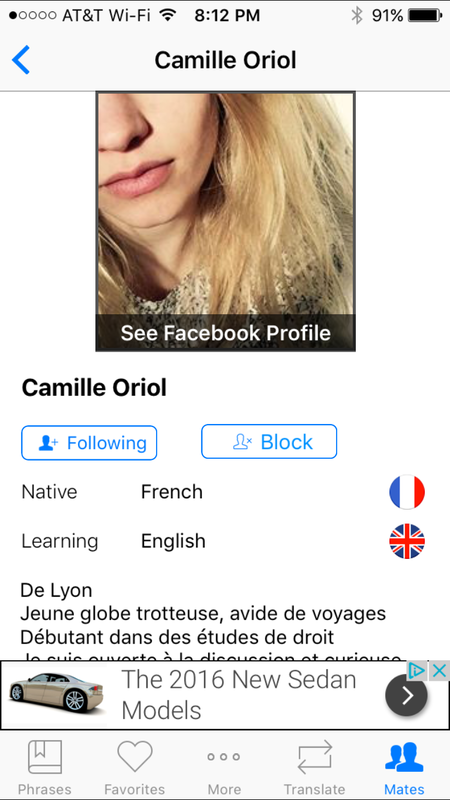 Tap on Mates tab to view other users who are interested in the same language as you. Tap on the langauge selector flags to see users interested in other languages.